CEDAR-AL cedar oil now colorless, safe to use on most fabrics. NOTE: Even though our products are 100 % natural and environmentally safe, and although allergic reactions are rare, it is NOT recommended for use on very small pets such as: Hamsters, Gerbils, Rodents, Guinea Pigs, Spiders, Tarantulas, Snakes and many other small animals. For these small animals, consult your veterinarian for more appropriate methods. Only to be used on humans, horses, cattle, and dogs (older than 6 months of age). MISUSE OF THIS PRODUCT MAY CAUSE PEOPLE AND/OR ANIMALS TO COUGH OR HAVE AN ALLERGIC REACTION. THEREFORE, IT IS VERY IMPORTANT THAT YOU READ THE SAFETY STUDY ABOUT CEDAR OIL LOCATED IN THE CEDAR OIL SPRAY PRODUCT PAGE IN THE ATTACHMENT AND FOLLOW THE APPLICATION INSTRUCTIONS. ALTHOUGH ALLERGIC REACTIONS ARE RARE, WE RECOMMEND THAT YOU TRY A VERY SMALL AMOUNT OF THE CEDAR OIL SPRAYED ON A CLOTH AND APPLY IT TO A SMALL AREA OF YOUR PET, PREFERABLY AWAY FROM THE NOSE AND MOUTH, TO TEST FOR A REACTION. NOTE: MISUSE OF THIS PRODUCT MAY CAUSE PEOPLE AND ANIMALS TO COUGH. Continue treating your pets and your home year round with CEDAR-AL cedar oil products to keep them pest free. If you have pets living in your home, you may need to rid your home of fleas occasionally. Have you ever walked into your living room and suddenly had your ankles covered in biting fleas? That is how you know that a flea infestation has gotten out of hand in your carpet. You may be tempted to throw the pets outside forever. Before you do try these simple steps to rid your home of fleas and prevent a future flea infestation. A flea infestation should be treated promptly because they can carry parasites such as tape worms. It is also advised to talk to your veterinarian after the home is rid of fleas about worming your pets. 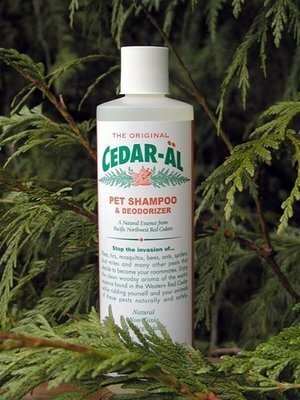 Bathe your horse, dog, cat, or wash your own hair with our CEDAR-AL cedar oil pet shampoo to ward off insects. First wet hair or fur with warm water, and with a small amount of the shampoo, lather the hair or fur, making sure the suds penetrate to the skin. Keep soap away from eyes, mouth, and nose. For animals, shampoo the entire body, legs, and feet. Let stand for 2 minutes. Rinse thoroughly. For humans repeat as necessary; for animals repeat every two weeks or as necessary. For our kitties we wash them with our pet shampoo, see Fluke's photo, our youngest, on the front of the website, and treat the house with the cedar oil spray. Wait until your horse, dog, goat or cattle is thoroughly dry, then spray them lightly with the CEDAR-AL cedar oil in a well-ventilated area, being careful of the eyes, mouth, and nose. Rub the oil into the fur down to the skin of the entire body, legs, and feet. Repeat every two weeks or as necessary. For dogs under 20lb SPRAY THE OIL LIGHTLY ON A CLOTH AND THEN RUB THE PET DOWN FROM NECK TO TAIL. 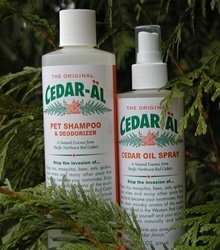 Refresh your pets sleeping area, your car, barn and or anywhere else your pets hang out with CEDAR-AL cedar oil. Please read more in the Infestation article. For under your home's foundation, with a three gallon sprayer, apply the cedar spray directly undiluted with a panning movement (left to right) walking fast (make sure to wear a breathing mask and goggles, please read the safety study on our website under the animated dog) reapply every other month or as needed. After the third time you will only have to do it every four months as the product will start penetrating the wood or insulation and pests will never want to be near there. You should be able to notice a difference right away, most noticeable in about a month. Spray CEDAR-AL cedar oil on the tablecloth before you set the table when having barbeques, picnics, or dining outside to keep bees and mosquitoes away while you enjoy your meal. Before going hunting wash your clothes, in addition to the laundry soap, with 3oz of CEDAR-AL cedar oil and then bathe yourself with the CEDAR-AL cedar oil shampoo. And then spray yourself with the CEDAR-AL cedar oil throughout the day to keep any insects away and to mask your human scent! Please refer to our hunters instruction article on our home page for more detailed instructions. Spray CEDAR-AL cedar oil in your pantry to keep bugs and moths away. It’s important to address your carpeting as well. Spray CEDAR-AL cedar oil on your vacuum bags and carpeting throughout the season to rid you of possible flea eggs that may have been left behind. See how to use our carpet shampoo below. Refresh your cat’s litter boxes by spraying CEDAR-AL cedar oil on or around the cat’s litter area. Spray CEDAR-AL cedar oil in wood boxes to eliminate mold and bad smell and in your cedar chest to keep the fresh aroma and the moths away. Before storing clothes away for the summer or winter, to keep moths and other pests away from them and to prevent them from becoming musty smelling, spray the clothes directly with CEDAR-AL cedar oil or spray CEDAR-AL cedar oil on a strip of cloth and drop it in the dryer when drying the clothes or air-fluffing them prior to packing them away. For an added effect, spray CEDAR-AL cedar oil on a strip of cloth, a piece of wood, or a pine cone and drop it in your cedar chest or hang it in your closet; for best results re-apply every two weeks. Spray CEDAR-AL cedar oil inside shoes. Use as an air freshener, spray CEDAR-AL cedar oil in the car or anywhere else for a nice woodsy scent. If you will be treating your lawn with CEDAR-AL cedar spray and using an irrigation system, mix 4 oz of our cedar oil per 1000 feet to your solution tank per month to keep fleas, stink bugs and other insects away and to destroy insect eggs. If you will be using a pump lawn sprayer and applying it directly, dilute the cedar oil, 3 oz to 1 gallon water. Because there are different types of grass, we suggest that before applying it you test a small area first. Please note, it is not recommended to spray plants or flowers directly with the cedar spray. If your horses roll all over after you bathe them with other shampoos, try our CEDAR-AL cedar oil shampoo and they will not dirty themselves after their shower. 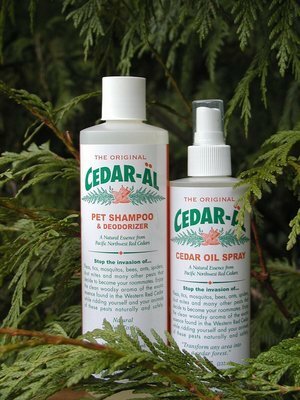 Bathe your pet or wash your own hair with CEDAR-AL cedar oil pet shampoo to ward off insects. Wait until thoroughly dry, and then spray you or your pet lightly with the cedar oil in a well-ventilated area, being careful of the eyes, mouth, and nose. Rub the oil onto your skin or into the fur of your pet down to the skin of the entire body, legs, and feet. Repeat every two weeks or as necessary or in preparation for planned hiking trips, thoroughly spraying socks and shoes, or outdoor activities where biting insects are present. 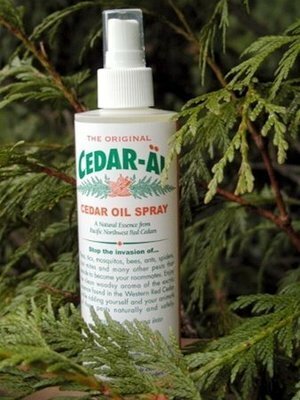 Spray CEDAR-AL cedar oil lightly on you (if you are not allergic to cedar) during outdoor activities to keep fleas, ticks, bees, mosquitoes, chiggers, flies and other insects away. DO NOT SPRAY DIRECTLY INTO EYES, NOSE AND EARS, especially with horses to keep flies and mosquitoes away, use your fingers to carefully tap CEDAR-AL cedar oil around the eyes, nose and ears area. Like most medicines and chemicals, keep out of reach of children. If irritation develops on skin, discontinue use. Do not spray on finished wood. These are just some of the many ways our customers have shared how they use our products. Please contact us if you would like to add a suggestion. The cleaning methods listed below can be used for any minor insect infestation, fleas, tics, bedbugs, spiders, etc, or prevention of one. A major infestation will, unfortunately, require a full chemical treatment but then a natural preventative solution, as listed below, can be used thereafter. Be sure to treat your pets as well as they are another vessel by which insects find their way into your home. AGAIN: IF YOU ARE ALLERGIC TO CEDAR, DO NOT USE IT ON YOU! The first control strategy for all insects is to modify the area surrounding a house. 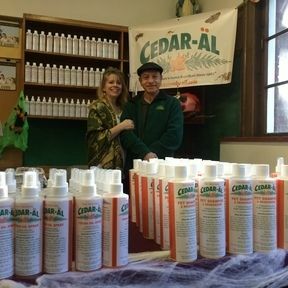 Because insects come into homes from outdoors, a barrier with CEDAR-AL cedar oil should be applied around all of the doors and windows, the outside of the walls and perimeter of your property and the foundation underneath your home and out buildings. If you have any untreated wooden walls or floors, you can “paint” the cedar oil on these areas. Because rain and weather will affect the spray barrier, it will need to be re-applied every six months or as necessary. Since flea bombs only kill live fleas and don’t destroy flea eggs, during the cold and winter months keep insects out that want to come in from the cold, mainly SPIDERS, by spraying a natural and safe insect deterrent such as cedar oil along the molding, on carpets, doorways, around windows, and anywhere inside of your house, being sure to ventilate when using CEDAR-AL cedar oil. Spray CEDAR-AL cedar oil along the base of all walls. It is vital that you find all cracks and openings in your walls and spray those as well. Examine all pipes, cabinet overhangs, and interiors (you'd be surprised what the contractors leave unfinished). Wear protective clothing such as shoes or gloves when working outdoors. Do not overlook your garage as this tends to be a primary location where scorpions gain access into your home via entering the walls, A/C ducts, or via the garage access door. Spray CEDAR-AL cedar oil around kitchen garbage pails. Keep the dust mites and bed bugs OUT of your bed by spraying your pillows and bedding with CEDAR-AL cedar oil. Note: anything with down feathers in it encourages dust mites; it’s their second source of food besides you! Wash items in the washing machine that will fit and are machine washable such as bedding, furniture covers, throw pillows, stuffed toys, and rugs and add about 3 oz of cedar oil to the detergent. Items that can be dried in an electric dryer should be as the heat will kill any survivors. Spray cedar oil on a strip of cloth and drop it in the dryer when drying the clothes or air-fluffing them for added benefit. Spray items such as furniture and large stuffed animals that you cannot shampoo or launder with the cedar oil and mist anything you did not shampoo or launder. Because TRIPLE ACTION PLUS' technologically advanced synergistic blend of 200 billion adapted organisms will settle to the bottom of your bottle in between each use, it is VERY IMPORTANT to shake your bottle well before EACH use for the product to do its job effectively. TRIPLE ACTION PLUS’s unique formula gives you power and versatility beyond other products. And it’s easy to use. Shake well before each use and then just point and spray TRIPLE ACTION PLUS on any water safe fabric where there is an odor or stain problem, not into the air, for complete odor control and stain removal. Because TRIPLE ACTION PLUS kills odor causing bacteria on contact, spray directly into the cat litter box and the surrounding area for immediate odor relief. Keep a bottle by the commode and spray directly into the toilet and the surrounding area for instant freshness. Freshen your home naturally. Do you have doggy odor in your home? Do your pets sit their butts on your furniture? Lightly spray your furniture, carpets, drapes, pet beds etc with TRIPLE ACTION PLUS for complete odor control. When cleaning your carpets, in addition to your cleaning solution, add 4 oz. of TRIPLE ACTION PLUS to the clean water tank of your carpet cleaning machine. If after running the cleaning machine you find a hard to clean spot, follow the directions above, using a soft bristle brush carefully brush the spot, and then run the machine over it again. Don’t have time to clean right away? Not a problem, TRIPLE ACTION PLUS will clean and deodorize on its own! Spray over stain thoroughly and leave it alone. Special ingredients actually consume the spill or stain and leave a clean, fresh scent. No residues to re soil, just water and carbon dioxide, just like your breath. It is fast, simple and safe for use around children, pets and plants. Use on any washable fabric or surface. If your cats are having a turf war and marking territory, ie your furniture, bedding, etc., first clean the furniture with our TRIPLE ACTION PLUS, making sure to sop up as much of the urine as possible ** and launder what can be removed adding an ounce of the TAP to the wash, and then spray the area until saturated with the TRIPLE ACTION PLUS, letting it completely dry. When dry, spray the area with cedar oil spray, trust us, they won't revisit that spot. To remove fresh stains with biological spills, ie blood, breast milk, spit up, etc from clothing, first, pretreat the spill with TRIPLE ACTION PLUS, then add an ounce of the TAP to the laundry and wash as usual. 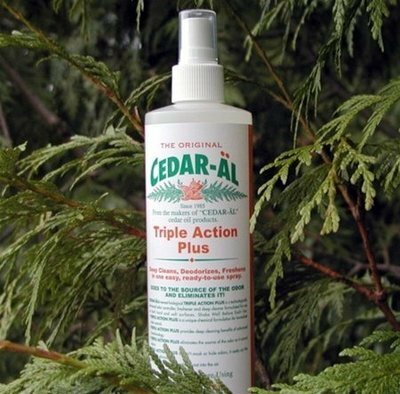 TRIPLE ACTION PLUS does not contain cedar oil. To obtain the best results, vacuum the carpet or upholstery thoroughly to remove all loose dirt particles. For spot cleaning use our Triple Action Plus. The approximate square footage 4 oz of our carpet shampoo, depending on the size of the cleaning machine you will use, see usage instructions below, will cover is 400 – 500 square feet or a LDH (living room, dining room, hallway). It all depends upon how much the operator of the cleaning machine uses when they are cleaning. There are 12 oz in 1 bottle of our carpet shampoo, or enough for 4 applications when used with a machine with a 5 gallon tank. We suggest not to over saturate your rug when cleaning as, with any kind of rug cleaning solution, it will leave a buildup resulting in re-soiling of your carpets faster. If you find that a heavy traffic area didn’t come quit as clean as you like the first time around, wait the minimum of one full day the best would be a week and then clean the area for a second time. Please keep in mind that cleaning and treating your carpets with our cedar oil is only part of the battle. For best pest control we recommend to bathe your pets with our cedar oil pet shampoo and treat your home with our cedar oil spray year round, please read more about these products, the benefits of each (listed under each product) and how to use them, listed above. For best results use an anti-foam emulsion to control excess sudsing. Put the anti-foam emulsion in the RECOVERY TANK not in with the cleaning solution. Always remove any remaining solution from equipment, clean and flush complete system with clear water. CEDAR-AL Cedar Oil Carpet Shampoo contains no harsh chemicals or alkalis which may leave deposits in your expensive equipment. 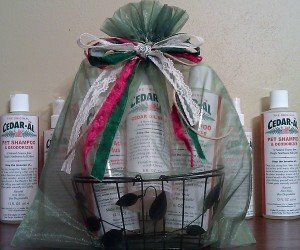 CEDAR-AL Cedar Oil Carpet Shampoo is biodegradable and environmentally safe. Fill your carpet shampooer with CEDAR-AL Cedar Oil Carpet Shampoo following your portable extractor machine, Hoover, Bissell, Commercial, etc, manufacture instructions. Fill the water reservoir as usual. Mix 2-4 ounces, depending on the amount of cleaning required, of CEDAR-AL Cedar Oil Carpet Shampoo with 5 gallons of hot or cold water, OR for heavy cleaning and smaller cleaning tanks, add 2.5 ounces to 1 Gallon of water OR 1.25 ounces to a 1/2 Gallon of water, etc . If extractor is adjustable, set meter to lower quarter. Most machines will have to be set very low. If the metered CEDAR-AL Cedar Oil Carpet Shampoo solution is still too rich at your lowest setting, dilute, again with an equal part of water. Repeat adjustments until optimum cleaning results are obtained. 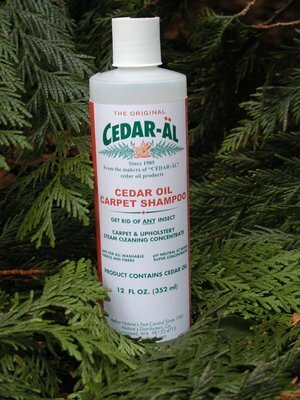 To make a working concentrate: Add 1 quart of CEDAR-AL Cedar Oil Carpet Shampoo to 5 gallons of warm water. Adjust flow meter to the lower quarter of the range and test the cleaning ability. One quart should make approximately 450 gallons of working solution. Adjust meter until satisfied with cleaning results. Hydraforce, high pressure: Add 12 ounces per gallon of water. Hydraforce, low pressure: Add 8 ounces per gallon of water. Open your windows, turn on fans, and point them into the rooms you have shampooed so the carpet can dry faster and the concentrated cedar oil can ventilate. If you cannot open the windows, use fans and a dehumidifier. Please read Safety Study to understand why this step is important. Vacuum the carpet thoroughly once it has dried completely overlapping each pass with the vacuum by at least two-inches.